If you’ve ever made a New Year’s promise to eat more healthfully, then you know how easy it is to slip back into less healthy eating routines. “People go into these plans with the best of intentions, but sometimes they don’t have the best information to support their changes,” says registered dietitian Kathy McManus, director of the Department of Nutrition at Harvard-affiliated Brigham and Women’s Hospital. It’s hard to stick to diets requiring you to exclude foods in an unrealistic way. For example, if you vow never to eat another sweet treat again, you may cave in to cravings faster than you would have if you’d allowed yourself a reasonable treat occasionally. “Being restrictive is not sustainable. You have to think about looking at this for the long haul,” McManus says. She recommends that you make your new eating plan a lifelong commitment. “Make it balanced, so you don’t feel deprived,” she suggests. If you want a treat, consider your daily calorie allowance (it must be tailored to your health and weight) and remember that a small amount of added sugar is acceptable — no more than 24 grams per day for most women, and no more than 36 grams per day for most men, according to the American Heart Association. Healthy fats. After the no-fat eating craze of the 1990s, some people still have a dietary fat phobia. Fats do have more calories per gram compared with carbohydrates and protein, but unsaturated fats are important for cardiovascular health. They’ve been found to lower LDL and total cholesterol when substituted for saturated fats. Include healthy fats in your diet by choosing avocados, olive oil, nuts, nut butters and seeds. Fruits. Nature’s sweet treats have sugar, but your body handles it differently than added sugar thanks to the fiber that’s also in fruit. Don’t forget that fruits are also loaded with vitamins and antioxidants. Berries in particular are associated with less weight gain and a lower risk of having a heart attack. “You need calories during the day, when you’re expending energy,” McManus says. “And if you’re not eating enough in the day, you may be so hungry at night that you overeat.” Plus, eating before bedtime can lead to heartburn, which may keep you from getting a good night’s sleep. She also points out that tracking your food provides you with an overall picture so you can figure out what’s working and what isn’t. “Maybe you’ll see you’re overeating at night because you’re overly hungry,” McManus says. A way to solve this problem is to keep a food diary. 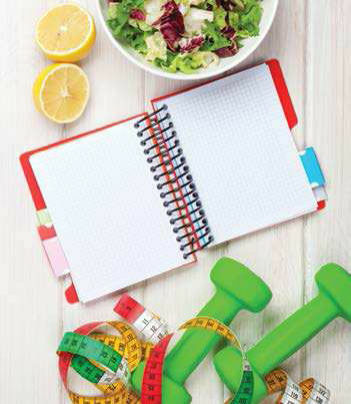 Use a notebook and write down information or use an app (for an electronic gadget), such as My Fitness Pal (www.myfitnesspal.com) or the USDA’s Food Tracker (www.supertracker.usda.gov), which also links you to apps that help you manage weight goals and physical activities.